At TechMySpace we use all our skills to bring you the best possible experience. Whether it’s mounting that LED TV on the wall, connecting those speakers or speeding up the broadband connection for a more responsive gaming experience. We can help design systems and advise on features with the aim of future proofing your investment. There are many difference ways of receiving TV and many reasons for wanting them. The selection process is mainly lifestyle and cost driven. The main sources are shown to the right – hover your mouse over each item to see the pro’s and con’s of each. As well as considering what you want to watch it’s worth thinking about what device you will use and the features you want. 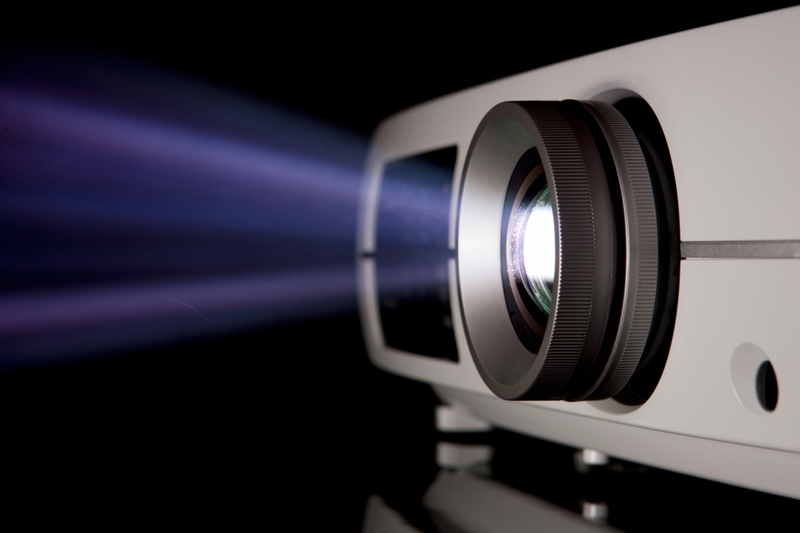 We offer a range to Audio Video (AV) systems depending on your requirements. These range from a simple dish to fully featured home cinema installation. Recording and time shifting: possible on most forms of visual entertainment, great if viewing is likely to be interrupted. Non-Subscription options: Although these are free per month, you normally have to pay for any additional hardware and often any installation costs. Films: Can often be streamed on smart devices or paid services or independently via their own provider (Netflix, LoveFilm and Amazon) for a small charge. OnDemand (OD): Steaming TV (I Player, YouTube) use Broad-Band (BB) to get the picture, so requires a High Speed connection. NB Some streaming systems can access legal content, often pre-release files stored in a volatile environment and not encouraged. OD requires a minimum 2mb for Standard definition and over 3-4 for HD. Due to large amount of data, it is advisable to use an unlimited BB plan but can be used via Wi-Fi or even mobile BB. TV is often the centre of a room and used for many purposes, entertainment, fun, games, education etc. ; as such, it is worth some consideration. TV: Most common viewing medium, large, clear viewing area and decreasing cost. All current TV’s include a FreeVeiw tuner often with Full HD, many have Smart options and a few include a FreeSat tuner. Smart TV’s need BB either cabled or Wi-Fi and although costs are continuously dropping, these features tend to be slow, clumsy and currently are often replicated [duplicated better] by other equipment (smart phone, tables, PC’s etc). PC: Increasingly common in small houses and flats as it allows the processing power and storage available in modern PC’s and Laptops to be used for both work and play. Requires BB for OD or a TV card to allow FreeSat / FreeView. Most recent computers have a HDMI output that can be easily used to reproduce the picture on a large TV. Tables: Usually used for private viewing of OD services. Requires a broad band signal, usually via Wi-Fi for portability and freedom. There are many different providers, each with different pros and cons., below is a short synopsis of the commonly available options. The best option depends on what you watch, where you live and of cause your budget. If you need a more detail please contact us, we will need to know your interests and the area you live in. Wall mounting TV’s is a quick and easy way to declutter a small room or make a statement in a larger room. 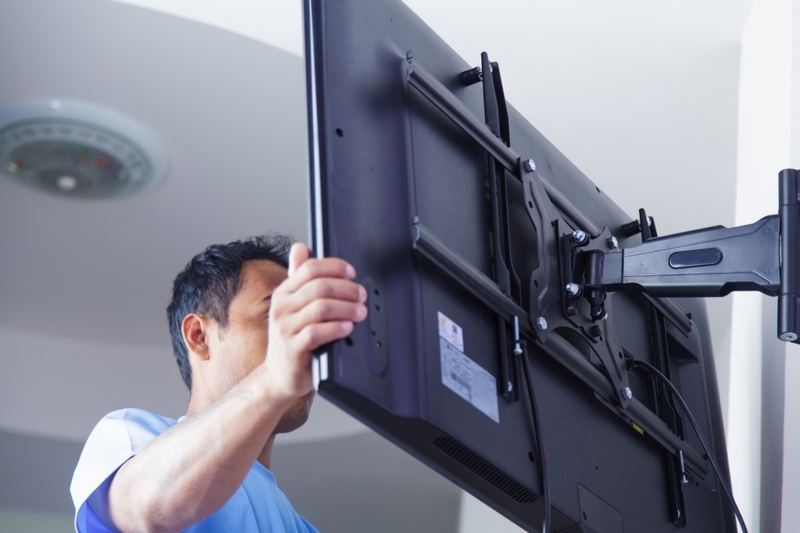 At TechMySpace, we mount TV’s for many reasons and our expertise can help select the correct locations. We have designed surrounding walls and furniture to highlight the TV while hiding the brackets and wiring. In a commercial environment it is common practice to mount CCTV monitors on desk or ceiling pole mounts. This gives a clear visual message to customers and employees that the system is working without taking up valuable floor space. TMS is happy to advise and make recommendations from the earliest stage of a project or work to existing specifications. We can install cables and connect existing equipment or terminate the cables for future proofing. Prewiring is becoming more popular, not just in high end houses but increasingly to add market value and to protect rental properties. Flexibility is key to all properties, be it working from home, entertaining at work, TMS can help increase overall productivity. Correctly designed and installed systems can help prevent messy and redundant wiring. A small investment in Tech, especially during the build or redesign stage, we can add significant value to your property, not to mention your standard of living. We have helped people increase the flexibility of their existing AV products often without adding a single visible wire. Sky – costs vary depending on package selected, good for sports, movies and general wide selection of viewing choices. FreeSat – as the name suggests, free to view, limited channels and the user needs to pay and install a suitable dish. Currently the only cable TV provider is VirginMedia, but has excellent Broadband speeds and superb selection of channels. Disadvantages – May be area specific and the cost can be relatively high. BT TV is a paid service and can be expensive but has the advantage of BT Sport channels and good selection of streaming options. YouView – has free and subscription offerings, with constant recording for pause and rewind, but requires specific equipment and possible contract. BBC iPlayer – free and can be used on multiple devices including mobile, but requires fast internet connection. Amazon – Paid service but relatively cheap, good choice – may require subscription contract. ITV Player – free and can be used on multiple devices including mobile, but requires fast internet connection. Surround Sound 5.1 usually requires 6 cables. Just let us know what you have or what your requirements are, we are always happy to advise, design, build and commission systems, just contact us. Weather it playing you favourite game on a 50” curved screen, or a simulator on 3 screens with 7.2 surround sound we can help. We implement many skill sets to bring you a more responsive and immersive gaming experience for the best possible price. Online gaming relies on connection speeds which in most situation means the Broadband (BB). We can implement many techniques to increase the performance. Although the ultimate BB speed is important, for serious gamers the response time (Ping) effects the ‘feel’. The Ping Time is the delay between asking for new data and it being delivered. TMS have techniques to increase both the BB Speed and the Ping time. Having a big picture is great but not when the sound is more like a mobile phone. Many modern flat screen are very thin and struggle to produce a full dynamic range. 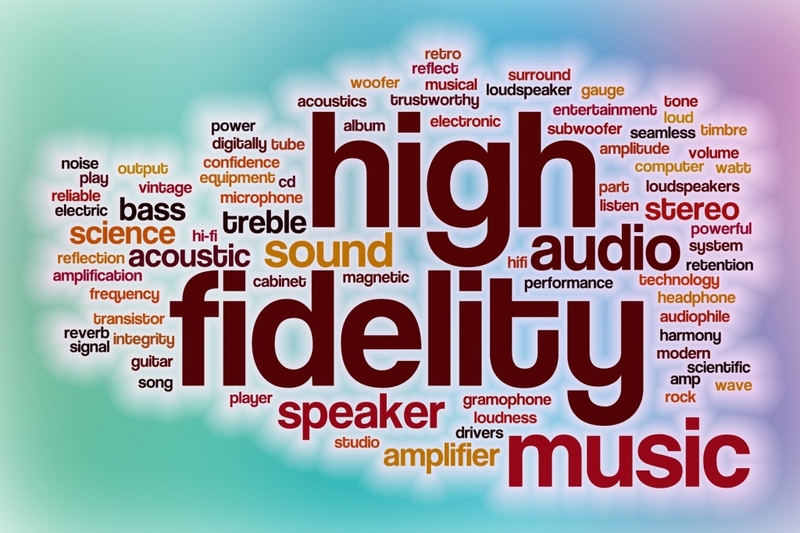 Surround sound can increase the frequency range and widen the focal point. 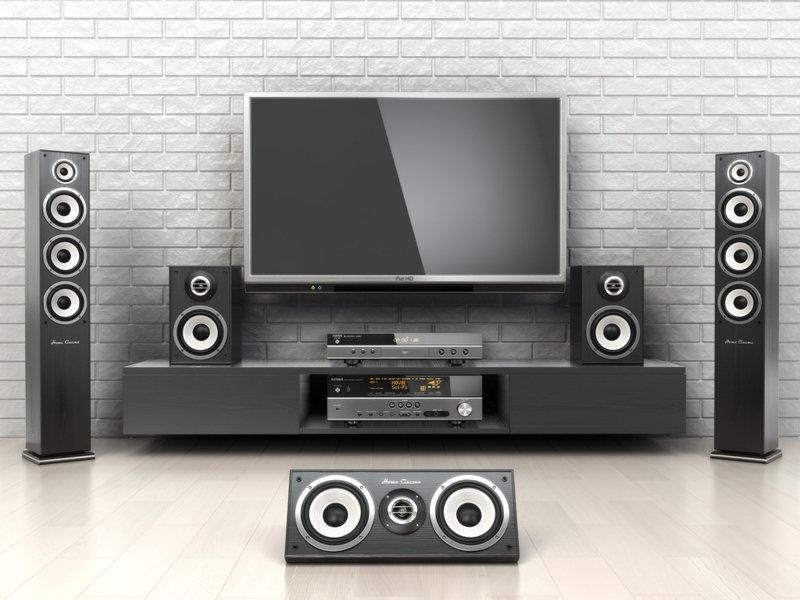 Most system can reproduce surround sound from standard sound sources but for the full experience sound recorded in the native format creates the full cinema effect. Sub Woofers: Add deep rich low tones that really open up music and action films. The low frequency sounds are not direction specific, this allows them to positioned freely without having a dramatic effect on the overall sound. Useful as these speakers are usually large and often require an independent power source. TMS often positions these discreetly out of sight or builds them into the surrounding furniture. Surrounds: These are often small speakers that produce the mid to high frequency sounds that are directional. These can add ‘size and space’ to the picture and greatly increase the viewing experience. Centre: These are usually bigger than the Surround sound speakers and designs for vocals. They help focus the viewer toward the screen where the characters are talking.